Insurance Business Canada reports "Insurers need to keep the foot on the gas on overland flood"
Below is our comment on the article, slightly edited and with some added graphics and links. Analysis is of historical flooding in Toronto in 2000, 2005 and 2013 and shows the correlation of overland risk factors (proximity to overland flow path and catchment slope) and observed basement flood reports during extreme events. From a physics, hydrology, hydraulics perspective there should be no surprise that the perils are related because the runoff accumulation that drives wastewater system extraneous wet weather inflows (and surcharges and backs up sewers into basements) is the same runoff accumulation that defines overland flow into a window well or reverse slope driveway or walkout. Raindrops do not know how they fit into insurance policy endorsements. Overland flow system today - reduced flow capacity / encroachment. Essentially, insurers have covered overland event damages in the past, unknowingly, because overland risks in one part of a neighbourhood have caused sewer back-up damages in others. But because damages are assessed at a property scale and not a neighbourhood scale, it would be impractical to deny coverage. RSA has recently acknowledged this 'concurrent causation' of flooding. The Toronto back-up and overland risk correlation suggests bundling of coverage should be mandatory in some areas with high overland risk. Why? Because insurers will be covering back-up damages anyway by insuring the neighbourhood's overland risk. Municipalities must keep a foot on the gas on infrastructure improvements that increase the underground system capacities (the sewer systems that handle the 'small' storms). 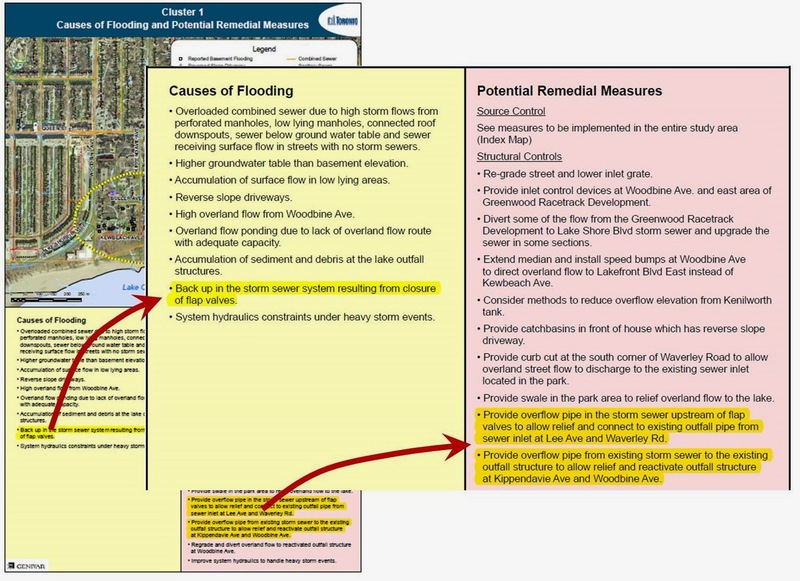 But they must also look in the rear view mirror and assess the causes of flooding and revisit their overland drainage system management - that is map it, enforce drainage easements, prevent infill that obstructs flow paths and avoid the repeat of enclosures that have caused issues in the past. This approach and the example above (Leaside, Toronto, former Walmsley Brook) are shown in our presentation Urban Flood Risk from Flood Plains to Floor Drains. Causes of basement flooding. Toronto Area 32 cluster area 1. No aging infrastructure is noted in the causes of flooding. Municipalities should also assess impacts of pollution control activities on basement flood risks and the province should mandate that pollution control activities not aggravate flood risks. Tanks to keep beaches clean in my neighbourhood caused basements to flood in extreme weather. The insurance industry could work with the province on this front and participate in studies as a stakeholder when basement flood risks can are an issue. Statements in the Insurance Business Canada article about aging infrastructure contributing to flooding are becoming tired because an old sewer doesn't lose much capacity, and even a displaced joint doesn't disrupt flow such either. Toronto has completed 30+ detailed basement flood studies and none have pointed to aging infrastructure as a key cause of flooding. Yes, homeowners with clogged laterals have a problem but this is not an issue for most mainline municipal sewers. The discussion must be refocused on the key factors affecting risk - if an aging concrete pipe becomes slightly rougher over time due to abrasion, this in no way compares to having the overland flow path filled in and blocked and lost forever, from a system capacity point of view. 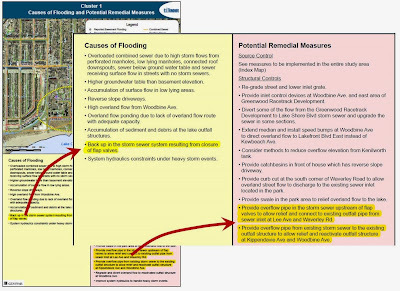 Municipalities should prioritize efforts and embrace low cost programs that can reduce flood risks through regulations and policy (preserve overland flow paths) to complement more expensive, long-term capital upgrades to sewer systems. Ironically, many sewers will good remaining service life (even 50 years to go) are being replaced to increase flood capacity now - not because of aging but because pre-1980's design standards did not preserve the overland flow path and now the barely-aged sewer is being upsized to compensate. Statements about increasing storm intensity like those in the article and in the media go unchecked and should not be used as the rationale for increasing premiums. While that is convenient, it moves us from an evidence-based approach to defining and solving problems (see recent post on the how Nobel Memorial Prize in Economics winner Daniel Kahneman would explain biased thinking about weather statistics and events). Spinach is not high in iron (sorry Popeye, it was a misplaced decimal point by a German chemist) - but a repeated story becomes fact in the mind of the public. So lets stay focused on facts and not anecdotes and continue to 'kick the tires' on assumptions when it comes to flooding... just like we would with a new Volkswagon.